I really like this set, so much so that I want to finish it. I'm not a set collector. The only thing I ever go after are Derek Jeter and Kevin Kouzmanoff cards and will gladly give away anything that isn't that. 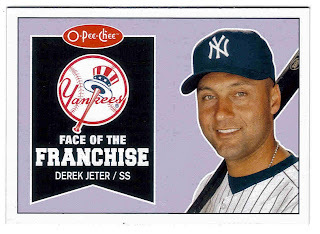 However, I bought an O-Pee-Chee blaster last night (with the cut out Jeter card) and want to finish it. So, I bought another one today. But there are a number of roads I can go down and I don't know which one to pick. OF the 600-card base set, I got 126 and about five doubles. Before we get to the options, let's see the highlights of the blasters. 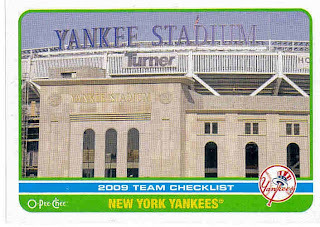 I like the Yankee Stadium, but of the stadium cards it's a little boring. Sweet! 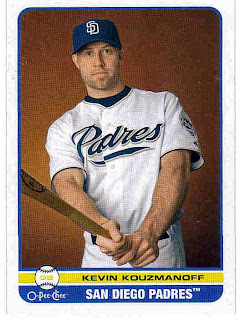 I got a Kouzmanoff base card. Although, he looks kind of scary on it. 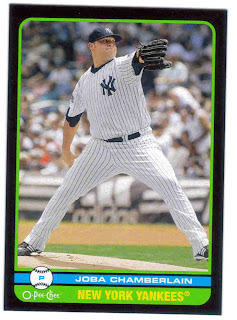 This is a Joba mini-black parallel. This was the favorite card that I got. 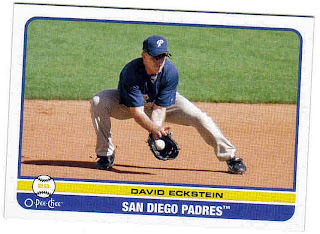 It was actually the only Jeter card. I didn't get a base of his in two blasters. Two things stuck out about the set that I didn't care for. One was the checklist cards. I love the stadium checklist cards, but they aren't all like that. Some of them have the floating heads. I got a double of the Cardinals checklist and that just have a bunch of floating heads of Cards. The other were the Moments card, specifically this Michael Young card, which I also got a double of. He looks bored and I don't see how this is a special moment from the '08 season. And why is it the '08 season? I got the same card as the last card in both blasters. Probably one of my least favorite players. 1. Do I collect just the base cards? 2. Do I collect the master set? Marie isn't me collecting the master set because I pulled this card. 3. Do I just not even bother collecting the set and stick to getting the Jeters. I think there are 13 different Jeter cards in this set alone. However, one thing I am considering doing is a little bit of a crazy project. I want to collect most of the base cards (excluding the checklist and team leaders cards) then send all of them out for TTM and see how many of them I get back. I am leaning toward this one because it's a little different, but we're talking about hundreds of dollars in postage. I like the TTM idea. It's different and it could jazz up a set like this. COLLECT THE WHOLE MASTER SET! I knew you would say that, Chris. I have ulterior motives: I need someone to trade with. 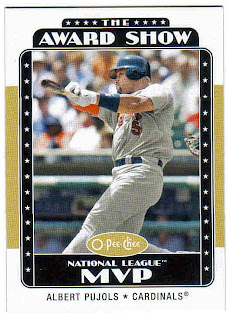 Collect the Jeters and buy some cards to mail out. But I was just thinking, if someone went out and took a picture of the new Yankee Stadium, couldn't that same person have stuck around to take a picture of A.J. Burnett and C.C. Sabathia so that we don't have cards of C.C. in his Indians uniform? I know, I know I am asking too much. Send them out TTM! I am a TTM junkie and there is nothing better than getting back a SASE with a success inside. 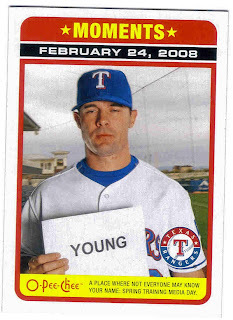 That Michael Young card is teh epic lulz for some reason.